Prepare sausage according to package directions. Place cooked sausage on a paper towel to absorb excess grease. Preheat a nonstick frying pan on medium heat. Crack shells and add all four eggs to hot pan. As the egg whites begin to cook, break the yolks with a fork. Flip eggs, after a minute or so and continue to cook until yolks are firm. Remove from heat and separate into 4 equal portions. 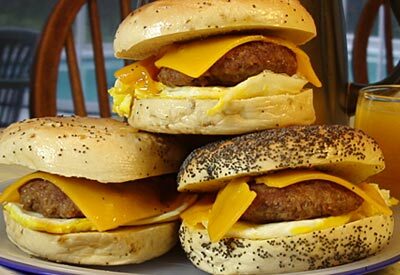 Meanwhile, grill or toast bagels on cut side. Spread butter or margarine on each bagel half. To asssemble, place egg on bottom half of each bagel. Top with cooked sausage patties and cheese. Place top of bagel on each sandwich and serve. Tip: Freeze individual sandwiches (once cooled) for a quick, delicious breakfast when you are short on time! Wrap in plastic wrap and place in a sealable freezer bag. Remove wrapping and microwave a frozen sandwich for 2 minutes or until warm.